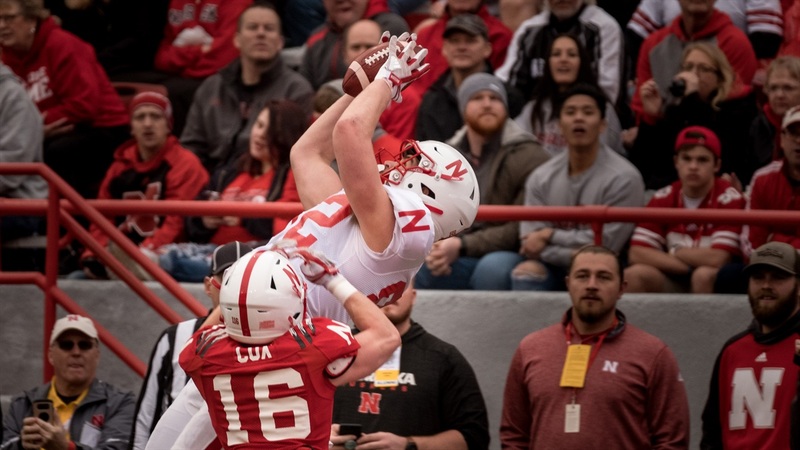 Based on Saturday’s spring game, Nebraska had a considerable amount of talent redshirting last season, whether for development or health reasons. Jaevon McQuitty, Austin Allen, Tristan Gebbia and Andrew Bunch all made plays throughout the game. However, it was redshirt freshman tight end Kurt Rafdal who made the play of the game in Red’s 49-9 win over White. Rafdal got the White squad on the board first with a 24-yard touchdown catch from Andrew Bunch at the 5:23 mark of the first quarter. The two teams traded empty drives early on, but late in the first quarter, the White found a groove as Bunch led his squad into the red zone. A false start bumped the offense back to the 24 for third and 11. At the snap, Rafdal took off up the left sideline while Bunch dropped back. Freedom Akinmoladun made a nice inside move and got some pressure through the left B gap but Bunch stood in and made the throw. Cornerback Ethan Cox was running stride-for-stride with Rafdal, but Bunch threw it high and wide to the 6-foot-7 tight end and Rafdal spun and pulled it down. The nearest official couldn’t believe he caught it in-bounds either as the initial call was incomplete. However, a second official huddled with the first and they corrected the call as Rafdal clearly got the right foot down before falling out of bounds. Rafdal said making that catch early on helped to settle the nerves of playing in front of a packed house at Memorial Stadium. “Going out there, I never really played in front of 90,000 people before and being able to make a play like that made me settle in a little bit and got me through the rest of the day,” Rafdal said. Saturday was a good day as a whole for the tight ends. For the Red team, Allen caught three passes for 43 yards including a 26-yard gain while Jack Stoll. the most experienced tight end on the roster who has established himself as the leader of the group, added three grabs for 17 yards. The touchdown was Rafdal’s only catch for the White team but sophomore David Engelhaupt caught two passes for 23 yards as well. “I knew they used the tight ends but I didn’t think they used them this much, which is an added bonus,” Allen said. The Red team was stacked with most of the presumed first- and second-teamers and there were plenty of touchdowns and other big plays to share, but Rafdal struck first, showing terrific footwork and strong hands while scoring the only touchdown of the game for the White team. That’s why Kurt Rafdal’s 24-yard touchdown catch was the play of the game for the 2018 Red-White Spring Game.